Josh Brolin - His character of Llewelyn Moss is our portal into the film's story. The former child actor (The Goonies ) has come a long way. His subtlety resonates throughout the film, whether, scheming in his attempts to outrun Bardem's Chigurh, or gently ribbing his wife when we first meet her. Though he is the unfortunate catlayst of this chase movie, we identify with him, and hope he succeeds in outrunning the psychopath. Reminders that he is the son of James Brolin should stop after this performance. Kelly Macdonald - As wife, Carla Jean, her loyalty and love for Llewelyn does not blind her that he has committed a very foolhardy act. Her gentle chiding of him at the outset, slowly turns to concern, and finally into horror at the realization that Llewelyn may not only die. He may drag her down with him as well. Woody Harrelson - Carson Wells may be the only man who can stop Chigurh's killing spree. So not only does Harrelson instill his character with the wisdom of knowing and recognizing this evil. His portrayal also surprises because of the cockiness he brings to the role. Where most would have chosen to play Wells as cautious and weary informed by the knowledge of this killer, Harrelson chooses instead to play it macho. He knows that he is the only one who can stop Chigurh. 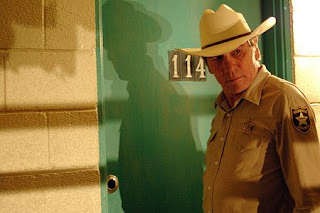 Tommy Lee Jones - Probably the most overlooked actor in this ensemble is Jones. He is the quiet center around which this movie revolves. The title refers to him. As Sheriff Ed Tom Bell, Jones projects the confusion that this old man feels at the landscape of senseless violence unfolding before him. He is the audience's surrogate. He asks why men are driven to commit senseless acts like Chigurh's murders or Llewelyn's robbery. His nightmare at the end is about how it is time for men like him to give way to the new order of killers and thieves approaching. If you're one of those folks who don't get the ending, it is because you don't get what the story is really about. It is not about who will get the money, or if they'll get away with it. It is about how helpless people are when fate drives each of them to their destinies.